Walls built on a sloping grade require a stepped-up base to remain stable and level, without burying extra block. Excavate leveling pad a minimum of 32 inches wide, according to Heritage Block’s guidelines. If there is a slope present, contact your local site civil engineer for help. Compact sub-grade to at least 95% Standard Proctor and level the base trench, making at least two passes with your plate compactor. Important: Make sure the blocks and the base of the next step-up are level. Compact the rock directly behind the already-installed blocks and the next step-up area, making a minimum of two passes with your plate compactor. Continue these steps until your retaining wall step-ups have been completed. 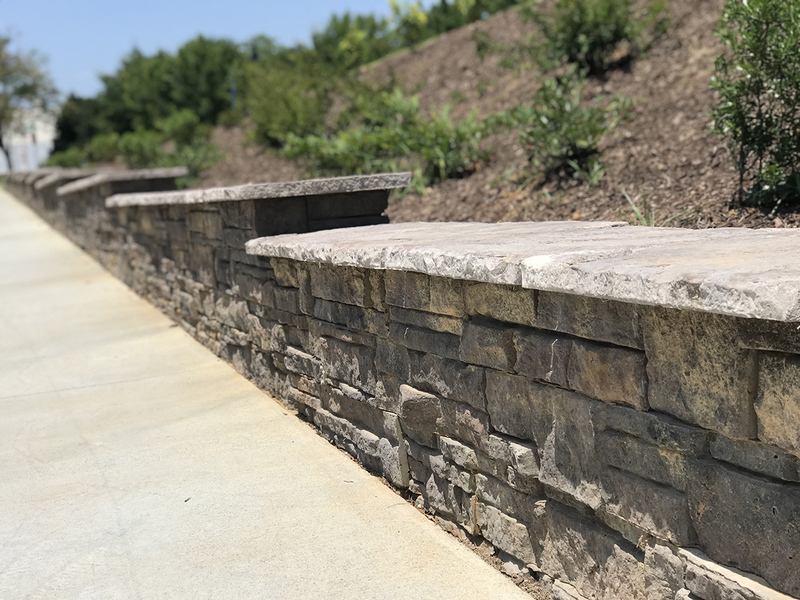 Keep in mind that the next level of the step-up must have a course of block completely buried to maintain the proper base depth and prevent erosion that could cause the wall to fail.